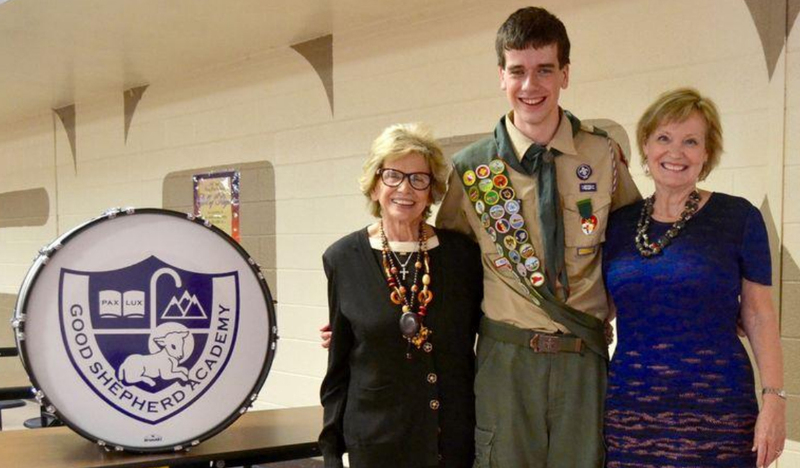 Johnathan Langberg, a student at Delaware Valley High School and a member of Shohola Boy Scout Troop 76 with Elizabeth Geitz and Brenda Ruello who founded the Good Shepherd Sustainable Foundation stand near a bass drum that was collected as part of Langberg’s Eagle Scout project. SHOHOLA — Children in an impoverished African country will make their own music soon. 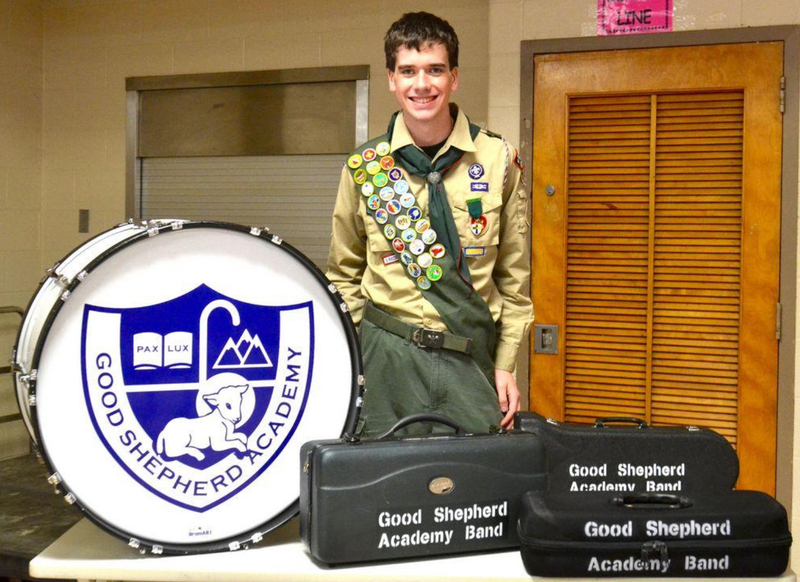 Jonathan Langberg, a student at Delaware Valley High School and a member of Shohola Boy Scout Troop 76 who has a passion for music, collected 33 band instruments that will be shipped to the Good Shepherd Academy in Cameroon in West Africa for his Eagle Scout project. Langberg connected with Elizabeth Geitz and Brenda Ruello who founded the Good Shepherd Sustainable Foundation that is based in Milford a few years ago. The foundation, Geitz said is a “cross-cultural partnership with a grass roots organization” which is the Good Shepherd Academy Association. Langberg himself enjoys playing baritone saxophone in the school’s marching and concerts bands, as well as the trumpet. Of the possible ideas for projects, Langberg said he wanted to do something that would affect others and have “tangible benefits.” If he didn’t collect the instruments and make the connections, Langberg doesn’t believe someone ever would have because the school is growing and as of yet, many aren’t aware of the music that they will now encounter since there isn’t a music program. Work for the project started in February, but most recently there was a donation day where Langberg received 15 instruments which he said was “really nice.” On that day, Langberg and some of his fellow scouts sat outside of the Pike County Library where people brought him: trombones, flutes and trumpets. The peoples’ generosity, he called “amazing” as well as “shocking” because 16 more instruments were donated since that day. All total there are 33 instruments that will go to Cameroon in West Africa that includes: brass, woodwinds and a large bass drum that was donated from Delaware Valley High School, where Langberg will be a senior in the fall. The drum Langberg called the “pinnacle of everything” as it now has the Good Shepherd Academy logo on it. As a musician himself, Langberg said words cannot describe how it feels to listen to a good song. To raise funds to ship the instruments, Langberg had a day where members of Eight Fingers and his dad Eric who is a performer played. Since the 5th grade Langberg has been involved in scouting and through the years, his goal of attaining friends has been achieved. The friendships, he said are some of the closet he will ever have. But, the experiences he’s had through scouting, are something Langberg feels he could not have otherwise had, as there have been many lessons. With so much happening in life beyond scouts, such as his academics and band, there was a point where Langberg considered stopping scouting. But, he said, this project was the reason he stuck with it, because of the excitement it created for himself. Johnathan Langberg, with the instruments he collected for his Eagle Scout project that will go to children at the Good Shepherd Academy in Cameroon in West Africa. Collecting and cleaning the instruments aside, the greatest task of this project, Langberg said was figuring out how to get the instruments to a country 5,000 miles away because there is no centralized mail service to Cameroon. So, after the US Embassy in Cameroon told Langberg there was nothing they could do, he found a shipper in Maryland who will send the instruments in two shipping containers. After a six-week boat trip, they will arrive at a port in Cameroon where the project manager for the school will pick them up. His favorite part of the project, Langberg said was receiving the new drumhead for the bass drum because he realized the African children will have real instruments to learn how to play music. Currently, there are no instruments and so, next year a music teacher will be hired. In addition to the instruments, method books will be given because they are “starting from scratch” but “that’s how you start learning” said Langberg. High School in Cameron is not mandatory and so, the children finish school at sixth grade Langberg said. But, the Good Shepherd Academy is a boarding school that is “bringing opportunities” to people as classes start at seventh grade. Bringing music to these children, Langberg said is “cool” because he has always been able to play when he has wanted, as he learned to play the trumpet when he wanted and then, he went on to learn how to play baritone because he wanted. Whereas, the children at the Good Shepherd Academy haven’t had that option.